9 February 2019 – Life Is Such A Sweet Insanity. I’m in the midst of my personal 30 (well, 28) day challenge for the month of February and it’s going quite well. This was in personal to me and not something I really wish to discuss on the blog as of yet, so there’s that. Since this personal growth challenge is going so well, I decided to add a 20 day tech challenge for the remainder of the month. I’ve been reading up about the latest flavors of iPad, Google tablets, and Microsoft Surface products; all manufacturers are claiming these things are their solution to the “ultimate computer”, no matter what form this computing device takes. All three solutions I’ve been reading up on, the iPad Pro, the Microsoft Surface Pro, and the Google Pixel Slate, offer a hybrid approach of tablet with keyboard. All but the iPad Pro provide support for a pointing device like a mouse or trackpad. I have the original version of the 10-inch iPad Pro. It’s my Electronic Flight Bag, having replaced my previous Mac Mini in that area, and it works very well in that role, especially when coupled with an Apple Pencil. My 20 day tech challenge for the remainder of the month is to see if I can do everything I want to do with my daily computing needs by just using this iPad Pro. My iPad Pro has the latest version of iOS and it is coupled with the Logitech Slim Folio Keyboard Case. 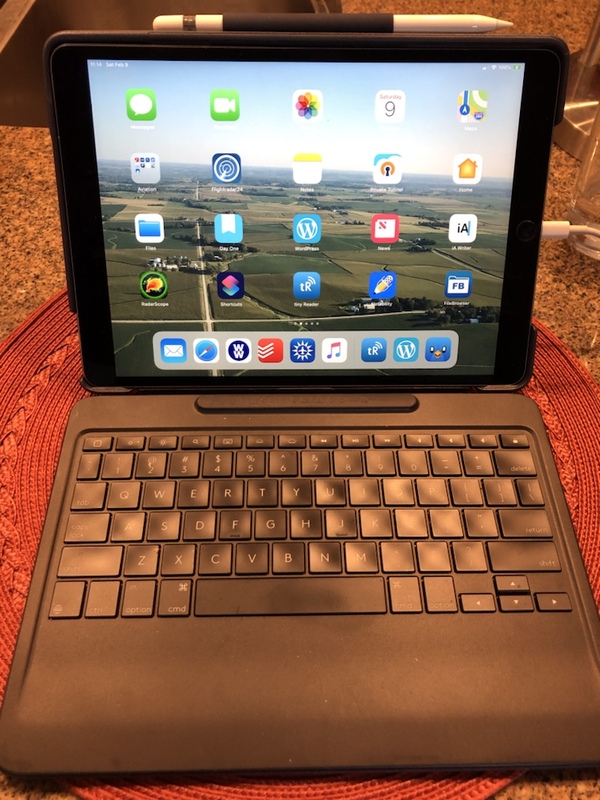 The keyboard is backlit and connects to my iPad through the SmartConnector, so I don’t need to charge it separately nor do I have to pair it via Bluetooth. It just works. I love that about it. I also love the keyboard. Though it is smaller due to the small size of my iPad, it is very comfortable to type on and I can fly along with my typing habits with ease. This keyboard also provides typical full-sized laptop function keys, something missing on the Apple Smart Cover available for iPad. I also prefer the Logitech keyboard’s touch, feel, and travel over the Smart Cover from Apple. iOS and the App Store provide all of the tools I need for this little quest I’m on. The goal of this 20 day venture is to force me to learn all the nuances of the iOS experience on an iPad and to determine whether it can ultimately fully replace my MacBook Pro. While I don’t plan on replacing this iPad any time soon (it’s the perfect size for the cockpit), I am looking at possibly replacing my MacBook Pro with the newer, larger iPad Pro, if it is something that I can absolutely do. One of my goals it to play around with editing video during this challenge, so don’t be surprised if you see a flight video or something before the end of the month. The tech companies are trying hard to push us to a tablet driven experience for our primary computing needs and it feels like we need to shift the computing paradigm a little bit to get technology moving in a forward direction again. Let’s see how my little experiment turns out.